What “jurisdiction” does ICANN belong to? How far can ICANN go to escape the nation-state? ICANN 60 (held in Abu Dhabi October 28 – Nov 3rd) made important progress on what has become known as “the jurisdiction issue.” ICANN is taking steps to reduce or eliminate the effect that U.S. sanctions against foreign governments would have on ordinary Internet users and businesses in sanctioned countries. It will also introduce choice of law provisions in their registry and registrar contracts, and open up continuing discussions of whether additional immunities are needed. What is “the jurisdiction issue”? The IANA transition and reforms brought an end to the U.S. government’s special status as the supervisor of ICANN and approver of all changes to the DNS root. This was a major step toward ‘de-nationalizing’ governance of Internet identifiers. Some members of ICANN’s Governmental Advisory Committee (GAC), mostly BRIC country governments who take a sovereigntist approach to Internet governance, have contended that that was not enough. ICANN was still incorporated under California state law, they said, and the U.S. federal government still could legislate or regulate ICANN activities in ways that gave it more power over ICANN than other governments. Motivated by a belief in traditional notions of sovereign equality, they sought additional reforms that would somehow mitigate any effects that ICANN’s incorporation in the U.S. might have. But not all concerns about jurisdiction stem from a pro-national sovereignty perspective. Cyber libertarians also want to minimize the impact of national jurisdiction on Internet governance. They want the Internet to be outside the nation-state system – not corralled into it through an international organization. That problem was too complicated and too contentious to solve in parallel with the IANA transition. Indeed, in many ways it worked at cross-purposes to the transition. The accountability reforms relied heavily on bylaw changes that leveraged California nonprofit corporation law to create mechanisms by which an “empowered” multi-stakeholder community could keep ICANN’s board and staff under control. Furthermore, at a time when nationalist conservatives in the U.S. were claiming that the whole transition was giving away a prized U.S. “possession” to Russia and China, the idea of re-incorporating ICANN in another country would have thrown red meat to the purveyors of that narrative. It would be difficult to address the jurisdiction issue without risking the entire transition. So the jurisdiction issue was bumped into “Work Stream 2” (WS2) a bundle of accountability-related reforms that did not need to be developed or implemented as part of the transition. There is no doubt that many players in ICANN, particularly US-based businesses and contracted parties, would have liked to stop talking about ICANN’s jurisdiction altogether. But to its credit, the broader community working in the reform process tried to accommodate those concerns. It created a subgroup on Jurisdiction as part of WS2. After a year of contentious work, the jurisdiction subgroup of WS2 came up with two important consensus recommendations. Final report here. 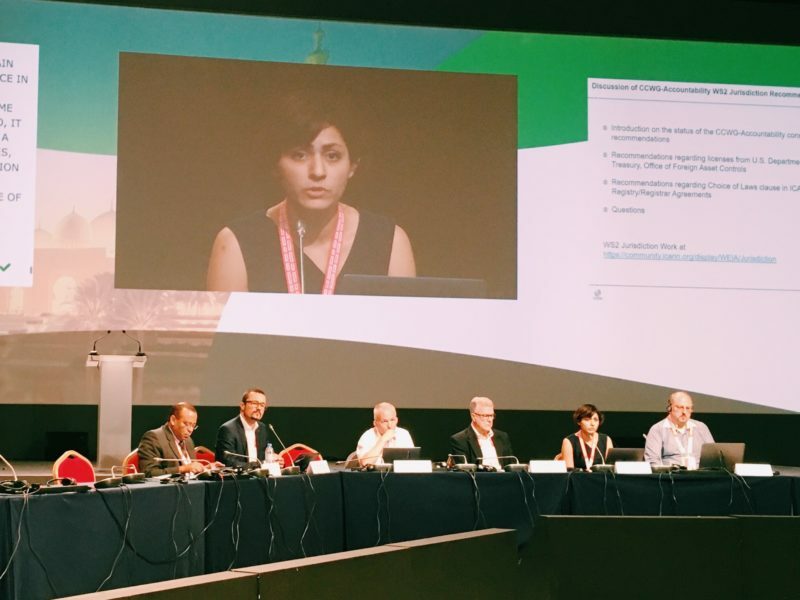 In the final moments of this process, vigorous dissent emerged from various GAC members, but at ICANN 60 those disputes seem to have been resolved in a satisfactory manner. The group identified OFAC sanctions as an area where U.S. jurisdiction clearly affected ICANN’s ability to fulfill its mission as a global DNS coordinator and policy maker. In another blog post, IGP has already explained how OFAC sanctions affect end users, domain name service providers, and participants in the ICANN regime. Led by IGP, the jurisdiction subgroup recommended that ICANN apply for a general license for DNS services. This would require new Treasury Department regulations defining and exempting the relevant DNS services. In the meantime, ICANN should be obligated to apply for OFAC licenses whenever one is needed (except for “Specially Designated Nationals,” the technical term for specific war criminals or other types of really bad people or organizations), because currently ICANN is not even obligated to apply. ICANN should also clarify to all non-U.S. contracted parties that they are not obligated to follow OFAC sanctions merely because they have a contract with ICANN. ICANN contracts currently do not specify a governing law or contain a choice of law provision. This seems to have been left open deliberately. The Jurisdiction Subgroup recommended a “Menu” approach, where the governing law would be chosen before the contract is executed from a “menu” of possible governing laws. The menu needs to be defined by ICANN and the registries. However, a balance needs to be struck between the ability to choose (or at least to negotiate for) a particular legal regime, and subjecting contracted parties and ICANN to too many jurisdictions. That is why the Subgroup agreed on a limited menu of choices. The Subgroup also spent time discussing broader kinds of immunity from U.S. jurisdiction. This is where it was unable to reach any agreement. In the abstract, some kind of immunity agreement could prevent ICANN from being subject to political or regulatory interference by the U.S. government. But there are three problems with this goal. First, no one in the subgroup came forward with any specific proposals for what such an agreement would look like. The only concrete idea proposed was to invoke the U.S. International Organizations Immunities Act, which would require the U.S. Congress to designate ICANN as having specific immunities. But asking the U.S. congress to rule on ICANN’s status is literally tantamount to asking the U.S. Congress to provide its permission for the IANA transition. Such a move would invite nationalist conservatives in Congress to think of various ways to reassert U.S. control over ICANN. Third, the concept of immunity is deeply in tension with the requirements of accountability. ICANN’s accountability to the global multistakeholder community is grounded in California law. This means it can be sued in U.S. courts. Too much immunity from U.S. law might also undermine the legal basis of its accountability. A list of specific exceptions to U.S. law is a risky approach because it is impossible to imagine all the exceptions that might be needed. Finally, ICANN cannot effect its own immunity, it can only make recommendations to others, either the U.S. government via the IOI Act, or asking governments for some kind of new international treaty. Neither option seems optimal, and there was clearly no consensus to be found around immunity. In moving forward, the Subgroup dismissed the push for immunity. Consequently, in the final stages of the subgroup, vigorous dissent emerged led by the GAC representatives of Brazil. In GAC sessions, Brazil’s complaints were echoed by the representatives of Russia, China, and Iran. Since it was obvious that no specific proposal for immunity was feasible or could command consensus, it was difficult for many people in the subgroup to understand where this opposition was coming form. The opposition of the Iranian delegate to the recommendations seemed particularly clueless because of the impact OFAC has had on Iran. In the discussions in Abu Dhabi, however, Brazil clarified that it was opposing the final report not because they were against the specific recommendations, but because they felt a broader discussion of immunity had been short-circuited in the group. Brazil’s ambassador Benedicto Fonseca Filho said “we are not against the recommendations;” they are “very useful, very helpful.” They could not support the final report, however, because the ground rules seemed to imply that if they supported it they would be condoning the idea that the discussion of jurisdiction is over. At ICANN 60, the conflict over jurisdiction seems to have been resolved by an agreement to continue discussion of the immunity issue. It is clear to all that a satisfactory proposal along these lines simply cannot fit into the timeline of WS2. But continued discussion may bear fruit. In a cross-community panel on the jurisdiction issue, the Brazilian GAC representative made it clear that there continued interest in immunity and jurisdictional neutrality “is not an attack on MS model;” is “not an attempt to empower governments over other stakeholders,” and “is not about moving ICANN HQ out of US;” they accept what was done in Workstream 1.